Recently, Google gave marketers another way to communicate to email subscribers. Similar targeting functionality has been available from Facebook and Twitter for some time. As of late September 2015, Google Adwords account holders can upload their customer email lists as Audiences within the platform. This allows Google to match uploaded email addresses with Gmail or other email accounts tied to Google’s free mail service. Simillar to remarketing lists, which include people who have previously visited a website or app, advertisers can now deliver marketing messages via their search engine, on YouTube and in Gmail. As long as the customer is logged in, she can be targeted. More on the particulars here. 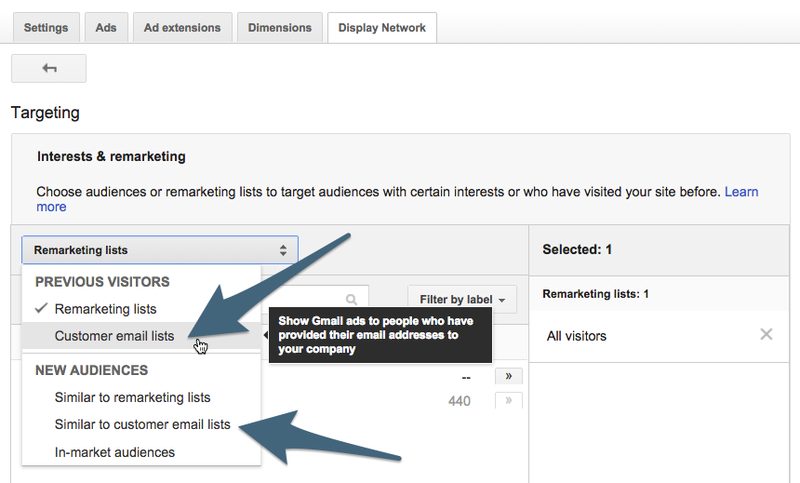 How can you create an email list audience in Adwords? Why? In what scenarios would a marketer want to employ this new feature? Let’s tack the “how” question first. The following is a step-by-step set of instructions for creating your very own customer email list in Adwords. Step 1: Export your list as a CSV. Tip: Make sure your list is clean by validating it with a service like LeadSpend or BriteVerify. They are both relatively inexpensive and well worth the time and money. Step 2: Find your existing audiences in Adwords. Within your Adwords account, navigate to the Shared Library tab on the left-hand side of the screen. Select Audiences from the Library options. Here you will see your existing Audiences if you have previously created a Remarketing list. https://teachtofishdigital.com/retargeting-tips/ Click the + REMARKETING LIST button and select the “Customer emails” option. Step 3: Upload your list. The following elements are need to start the upload process. Step 4: Target your list within campaigns. Once your list has been uploaded, Adwords will need some time to match your list with existing Google accounts. In the meantime, you can add your Email audience to existing campaigns. The following outlines the process of targeting an Email list within an existing retargeting campaign. Within your chosen campaign, navigate to the Display Network tab (note, you may find an “Audience” tab in other campaign types). Click on the +TARGETING button. 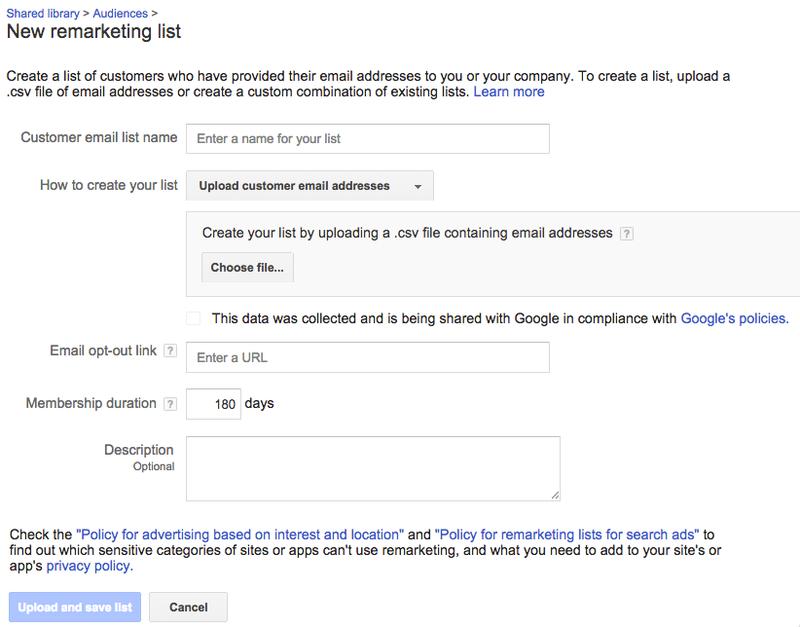 Under the Remarketing lists drop-down, select the “Customer email list” option. Select your list and save. Also, note that you can add an audience similar to customers your email list. Google will automatically identify individuals who have similar characteristics and behaviors to those on your email list. This is very much like Facbook’s Similar Audience product. From this point, you can simply add your new audience to other relevant campaigns, and measure the results. Why Use Adwords’ Customer Match Targeting? Only send email when you have something valuable to offer. Only advertise to your email audience when you have something valuable to offer. There is a fine line between being conveying timely value and just coming off as creepy, desperate and annoying. Choose the former, and use audience segmentation to your advantage. Craft ads and campaigns to those for whom they are most relevant. Here are a few examples of scenarios in which you might want to employ the Customer Match targeting from Adwords. Abandoned shopping cart ads (reminder: apply impression caps and campaign duration limits). Promote to prospects who have requested information about a specific product or service. Introduce new or related product lines to previous customers. Publicize an event to those who attended or RSVP’d to previous, related events. Extend your reach for limited time offers, deals, and programs. Good luck with your paid campaigns and your email programs. Let me know if you have any questions. I’m happy to help.